In stock -This product will ship today if ordered within the next 11 hours and 14 minutes. Delicious Panda Liquorice Creams are made with natural colours and flavours. The creamy strawberry and chocolate flavoured fillings create a mouth-wateringly soft taste sensation. Molasses syrup, wheat flour, sugar, vegetable fats (palm kernel, palm, shea kernel), liquorice extract, rice starch, fat-reduced cocoa powder, emulsifier (lecithin), colour (beetroot concentrate), natural flavourings (e.g. aniseed oil, vanilla), acidity regulator (citric acid). 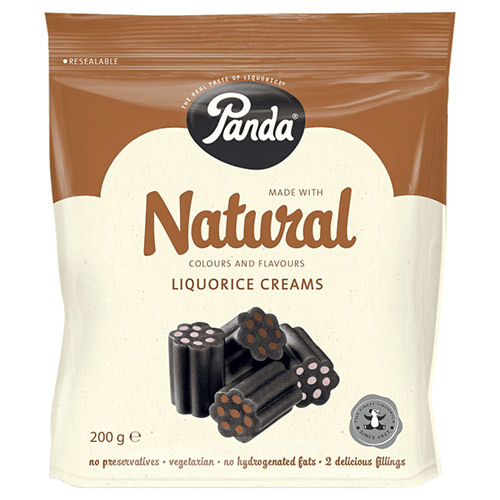 Below are reviews of Panda Liquorice Creams - 200g by bodykind customers. If you have tried this product we'd love to hear what you think so please leave a review.